Based on epsilon iron oxide (ε-Fe2O3), a new series of nanomagnet was developed for next-generation magnetic tape, by substituting the Fe ion with several metal ions. A magnetic tape was developed by using this nanomagnet. The developed magnetic tape showed an extremely low media noise and a very sharp signal, which is required for next-generation magnetic tape. The demand for magnetic tapes as large capacity archive recording media is rapidly growing in the big-data era with explosive increase in the information to be recorded. The present research result is expected to contribute to this social demand. A research group of Prof. Shin-ichi Ohkoshi et al. at the University of Tokyo developed a new series of nanomagnet based on epsilon iron oxide (ε-Fe2O3 ), ε-Ga0.31Ti0.05Co0.05Fe1.59O3, where Fe ions of ε-Fe2O3 are substituted by three metal ions, i.e., gallium ion, titanium ion, and cobalt ion (hereafter called GTC-type epsilon iron oxide). By controlling the metal substitution ratios, the coercive field of this GTC-type epsilon iron oxide was tuned to a suitable value for magnetic recording of 3 kilo-oersted (kOe). The magnetization value also improved from ε-Fe2O3 by 44%. GTC-type epsilon iron oxide nanomagnet was then synthesized in a medium-size production scale (5 kg), and a trial production of a magnetic tape was developed. The regenerative signal of the manufactured magnetic tape was very sharp, and the media noise was found to be extremely low. 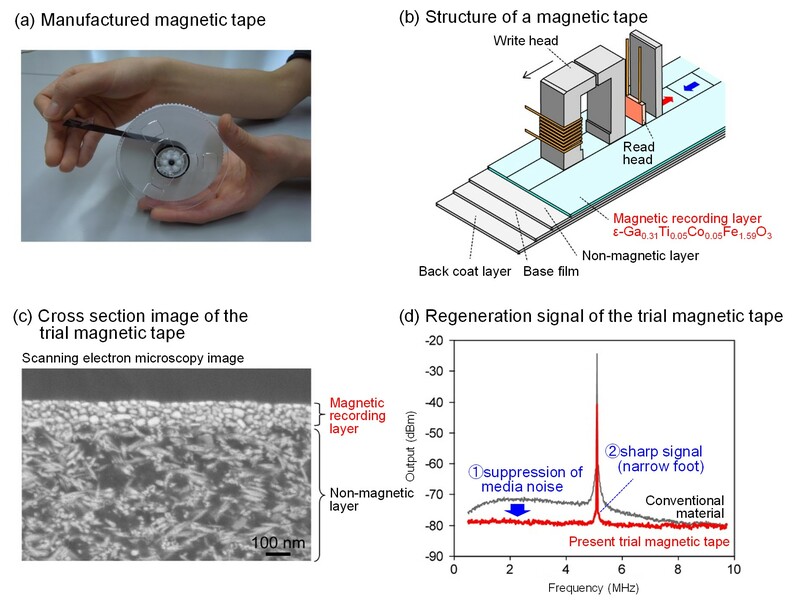 Therefore, GTC-type epsilon iron oxide nanomagnet is expected as next-generation magnetic recording material for magnetic tapes in large capacity archiving. The present research result will be released online as a Hot Paper from the journal of the German Chemical Society, Angewandte Chemie International Edition, on August 24, 2016 (WED) at 7 p.m. Japan standard time. Among the various recording media such as hard disc drives, magnetic tapes are presently attracting much attention with increasing market demands. This trend is even expressed as “revival” of magnetic tapes. We are now rushing into the big-data era with explosive increase of information, and the role of recording media for archiving is expanding. Especially, magnetic tapes are actively used in many places such as insurance companies, banks, broadcasters, and web services such as Google and Facebook, for their long-term guarantee and low cost. As magnetic particles for magnetic tapes, metal powders (cobalt-iron nanoparticles) have long been used. Recently, due to technological innovation by magnetic tape manufacturers, development of magnetic tapes for high-density recording is being actively carried out, e.g., the development of the recent product using barium ferrite. Investigation of new materials for next-generation magnetic tapes is also on the move, and a new magnetic ferrite of epsilon iron oxide (ε-Fe2O3), the world smallest hard ferrite , is drawing attention as a strong candidate. In the present work, Prof. Ohkoshi et al. chemically synthesize ε-Ga0.31Ti0.05Co0.05Fe1.59O3 (GTC-type epsilon iron oxide) nanomagnet, where the Fe ion of ε-Fe2O3 is substituted with gallium ion (Ga3+), titanium ion (Ti4+), and cobalt ion (Co2+) (Figure 1). Figure 1. (a) Crystal structure, (b) photograph of the large-scale produced powder sample (a portion), and (c) magnetic hysteresis curve at room temperature of GTC-type epsilon iron oxide magnetic nanoparticles. Inset is the transmission electron microscopy image. In this series of GTC-type epsilon iron oxide, the coercive field of 3 kilo-oersted (kOe), which is the suitable value for magnetic recording, was achieved by tuning the metal substitution ratios. The magnetization value was also improved from ε-Fe2O3 by 44%, showing that this material exhibits the suitable performance for magnetic recording. GTC-type epsilon iron oxide was synthesized in a medium-size production scale (5 kg), and a trial production of a magnetic tape was developed (Figure 2). Figure 2. (a) Photograph, (b) schematic illustration of the magnetic tape structure, and (c) cross section scanning electron microscopy image of the manufactured magnetic tape. (d) Regenerated signal of the manufactured GTC-type epsilon iron oxide magnetic tape and the conventional cobalt-iron nanoparticle (MP1, for reference) tape. Comparing the signals of the present material (red line) and that of cobalt-iron nanoparticle tape (gray line), the media noise is very low and is suppressed to about 1/10. The signal waveform is very sharp, and therefore, the magnetic tape composed of GTC-type epsilon iron oxide was found to possess high performances. This magnetic tape is composed of a magnetic recording layer of GTC-type epsilon iron oxide and a nonmagnetic layer on a base film with a back coat covering the bottom of the tape. The regenerative signal of the manufactured magnetic tape was very sharp and the media noise was suppressed to about 1/10, compared to the conventional tape using metal powder (cobalt-iron nanoparticles, MP1) (Figure 2d), indicating that the present material possesses significant properties demanded for next-generation magnetic tapes. In the present series of GTC-type epsilon iron oxide, the magnetic properties was tuned into the demanded spec for magnetic recording, and the magnetic tape using this material was found to exhibit significant performance. GTC-type epsilon iron oxide is expected as next-generation magnetic recording material for archiving large amount of data with high-density.